Small - $16.99 Only 5 left! Those Rebels need to be stopped! Agent Kallus is an officer of the Imperial Security Bureau, specifically charged with eliminating any rebel threats, and he knows exactly what it takes to do his job, and do his job well! His Imperial code name is ISB-021, a low number indicating his high rank (seems backwards to us, too, but alright!). Adept at hand-to-hand combat, Kallus is deadly in the field, and takes special interest in eliminating the Ghost crew. So if your kid is still loyal to the Galactic Empire, then get him suited up for combat this Halloween in this Star Wars Agent Kallus Costume. It recreates the gear worn by the Galactic Empire agent and it's sure to inspire your kid to serve Vader and his crew! 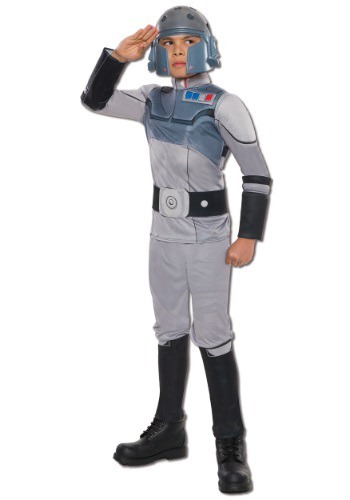 He’ll be just the boy for the job in this Kids Star Wars Rebels Deluxe Agent Kallus Costume, made of 100% polyester fabric and 100% polyurethane foam, your child things cozy while the costume keeps its shape! The pants have an elastic waist and the foam belt fastens with Velcro for an easy fit. The boot tops are attached foam, and the molded plastic mask has an elastic security band for a secure fit. With your child in this costume straight out of his favorite movie, all you’ll have to do to make this the best Halloween ever is point him to the direction of the Ghost and her crew, and then stand back and watch him bring out the end of the Rebellion!